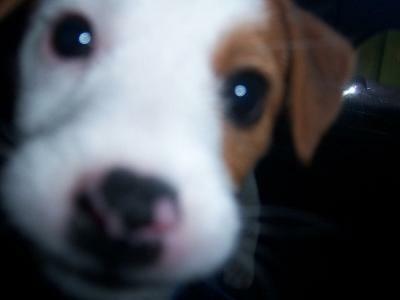 I have 2 Jack Russel terriers named Susie And Rockey. 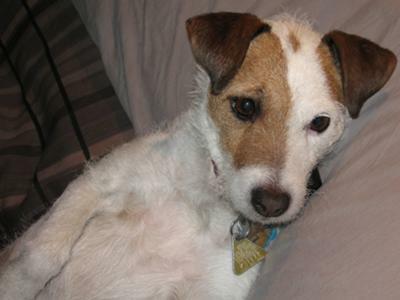 Susie Passed away in 2010 she was 6 years old. Rockey is still with us he is black and white. 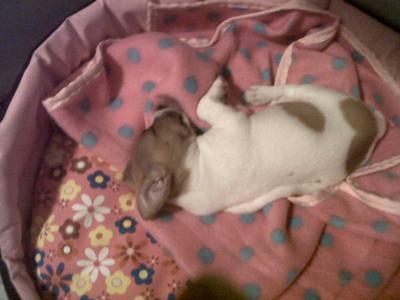 Susie was brown and white. 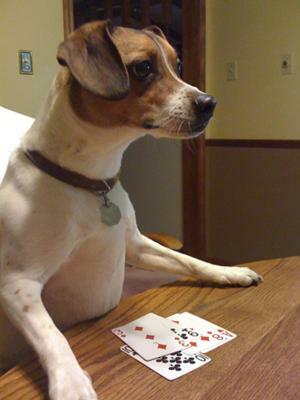 Wilson, is 2 1/2 years old lives in New Orleans, loves running free, swimming, playing catch and dog biscuits. Sprocket is a senior citizen and just had his 10th birthday, but you would never know to see him digging or chasing his ball. Sprocket loves ball and tolerates toddlers because the leave a trail of food. 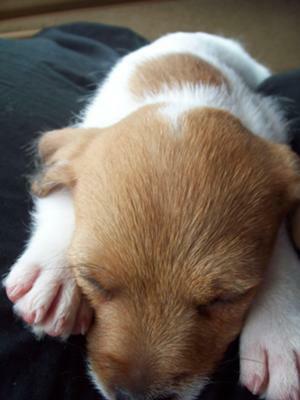 He lives with his best friends Lucy Lu a Wire Fox Terrier and Marley...you guessed it a Yellow Lab. Sprocket's favorite place in the whole world is the beach and often digs holes for sand castles with his young friends. 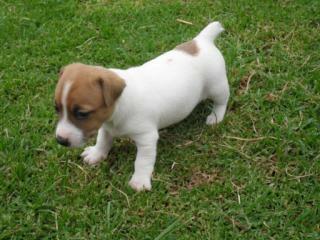 This is our new Jack Russell. We rescued him from our city pound. My seven year old son renamed him Jake and he has learned his name in record time. 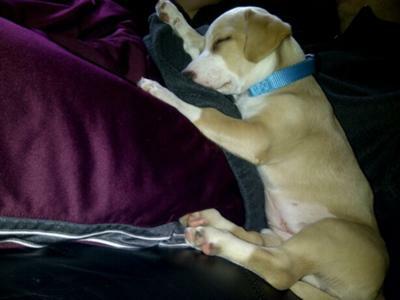 He is the perfect dog for a young boy! They are active and inseparable. He has taken the place of a wonderful Blue Heeler we lost in March. It has made the loss less painful for my son. He sleeps with him and swims in the pool, too. 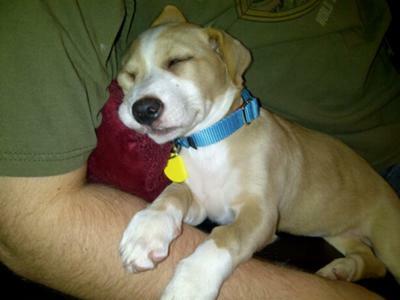 He is a bit of a thief--steals the bones from our other new puppy (Lab mix). Jake learns fast, is fun to be around and is a real ham!! 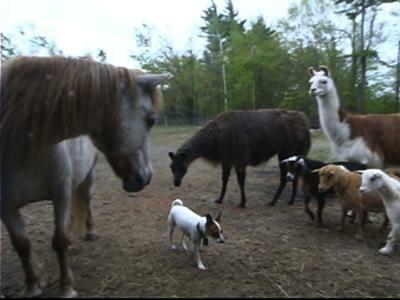 Our jack russell terrier often accompanies our animal rescue organization on our 'barn cat' placements. He attracts a lot of attention. 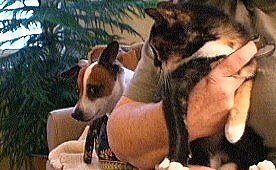 Our JRT is pretty curious about cats and vice versa. They don't seem afraid of him. 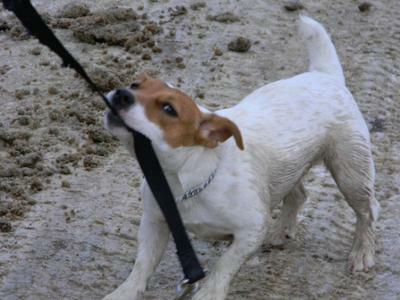 An Animal Control officer we knew said that she had picked up a JRT that needed a home and was a great little dog. We took him. It was all on faith. It was one of the smartest things we ever did. We have an animal rescue organization called Shelter Me Inc (www.sheltermeinc.org) and we take the little fellow along on almost all of our barn cat placements. That gives him ample opportunities to demonstrate his unique approach to life and fearlessness in all situations. We got Jack from a family who were splitting up. He is my first dog and had him for a couple of years. 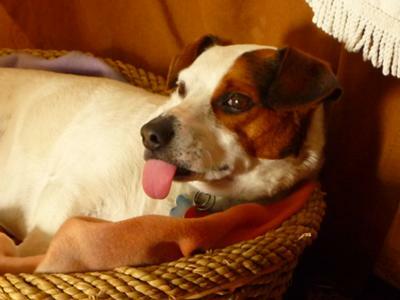 He is a great little pet his tongue always sticks which is part character. But over the last few days has had Menigitis and had to have a disc removed. He is in hospital at the moment recovering from his surgery and I miss him. They Love To swim al day! They have a tremendous amount of energy for their size, They think they are at least 150 pounds, and are fearless, often challenging other dogs three times their size, like my Great Dane dog we had before. They will not tolerate abuse even if it is unintentional. Lilly and Basil travel by plane every 6 months to Colombia South America, where they enjoy the swimming pool and big place to run around all day. They are very pleasant companion. We love both very much!!!! 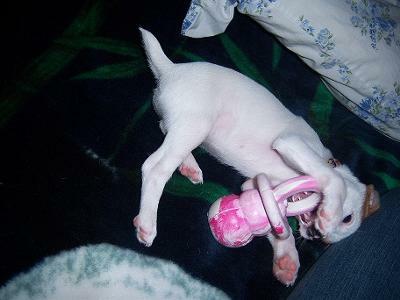 All my life I wanted a Jack Russell. Finally for my 30th Birthday my mother offered me one. We drove 18hrs to and from to get her. The moment I finally got to her she changed my life. Her name is Kiki, she will be 2 yrs old in August and she is my baby girl. She is a total sweetheart, she’s like my shadow. She follows me everywhere. 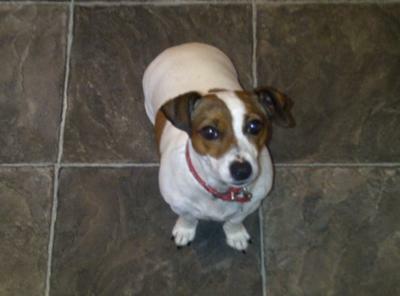 I can honestly say that she is a good JRT. I can let her out in the yard and she stays! Quite amazing because we live in the country and our yard is not fenced. But I think sometimes she has a bit of cat in her! She will go up on the kitchen table when we are not home! 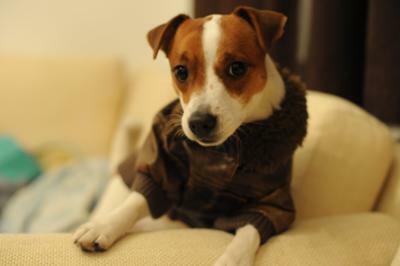 I love my JRT because she is loyal to me, she’s funny, smart and she gives me unconditional love. Also, as you can see in the picture she keeps me very active. She is a joy to have in my life. Mya is my princess and she acts like one too, Mya will only eat out of a plastic bowl or your hand and she will let you know if she doesn't like a song that is playing But she is loving especially towards children, likes to play catch, she tries to talk and does a very good job at it. Mya is very special to me I she was born at a neighbor of mines home and I went over to see the puppies I was having a rough go of things. When i got to their home I saw her she had the most color and actually looked like a girl! Gorgeous and beautiful blue eyes. I was the first person she was not afraid to go near, i guess I knew then that it was fate.Mya goes everywhere with me and is noticed everywhere we go. she is my baby girl and i could not imagine my life without her even tho its only been a short time that we've known each other. 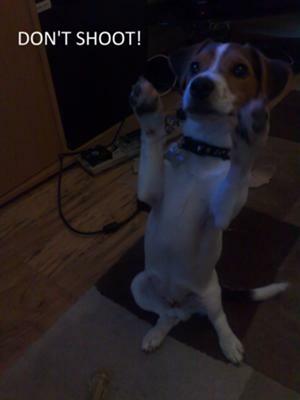 Bud, the cutest with his paws up. 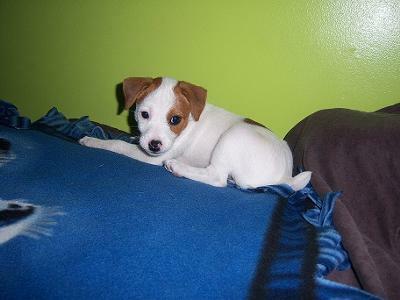 Google is an awesome jack Russell terrier, I had him now for a year and half. and it has been more then a wonderful friend. always energetic and ready for having fun.. love posing for the camera is just one of his other passion.. lol..And his love for the beach and water is amazing.. 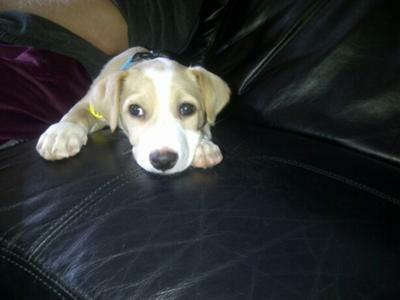 He is just one amazing little rascal..
Paisley is our little Jack Russell/ Yellow Lab mix, she is twelve weeks old. She has tons of energy but also loves to cuddle as you'll see in our pictures. 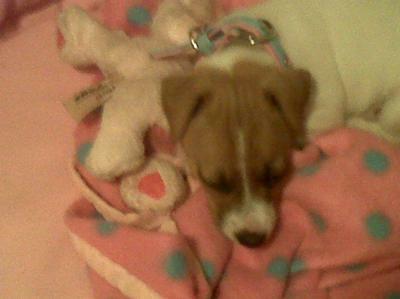 She is great with all people and other dogs, we couldn't be happier with our new little baby. My husband and I found Rose while vacationing in the country for our 3 year wedding anniversary. She is a delight! She has brought us closer together and charmed us to no end!! 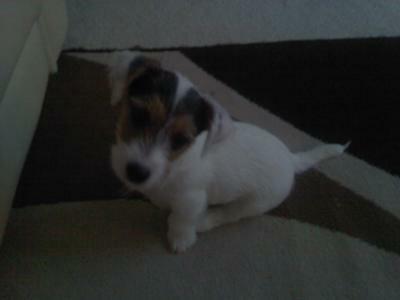 this is Roxy , one of her pics as a pup shes a lovely little JRT !! The best dog we have ever had. She truly is one of our family. She and her sister Maggie demand to be walked daily, and we're happy to oblige ! Katie is 5 years old, and is without a doubt the most loyal, loving dog that my wife Pam and I have ever owned. And yes, she is completely spoiled. Tried post comments! Could not do that,there was an error on the page.